…but also because their technology has progressed enough to create highly resistant kayaks that can offer control and stability at the same time. The number of models and brands have multiplied to the point where choosing an inflatable kayak can be a problematic task. Hence, we did an in-depth research to choose the top inflatable kayaks available in the market. Furthermore, with the help of this buyer’s guide, you’ll be able to make the most accurate pick that will address both your requirements and preferences. Here’s the list of 11 best inflatable kayaks that have passed our criteria. We have reviewed them thoroughly and also listed their pros and cons. This Advanced Elements inflatable kayak is a 15ft model that can be used for solo or tandem trips. Its technology makes it a one of a kind kayak that you’ll want to take to the water as many times as you can. This is the best inflatable tandem kayak you can get in the market. The kayak is constructed with built-in aluminum ribs that not only give shape to its stern and bow but also enhance its tracking. The deck of the kayak can be set up as an open or a closed one depending on what you like, and the seats’ high support offer plenty of comfort to paddle for a long time. This kayak also has an integrated pressure relief valve on the floor and its 3-layer material is double-coated to prevent holes and puncture. It is a 6-chamber model with a tracking fin and laces on the deck for easy access to fishing gear and other equipment. It also comes with its own carry bag and repair kit. The AdvanceFrame kayak is perfect for those who like paddling at lakes and bays. It’s among the best inflatable kayak choices if you like fishing with a friend every once in a while, as it can be adjusted to fit two seats. 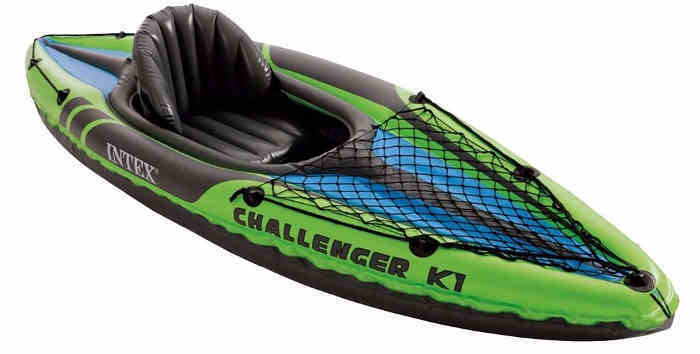 The Challenger K1 is a colorful, 9ft long kayak that fits one person and comes with a couple of extra accessories that will be explored in the sections below. We found this to be the best inflatable solo kayak. This inflatable kayak is made from a nimble but highly resistant material that has been welded and decorated with bright, noticeable designs to add safety to your outdoor trips, no matter where you are; it is made of a heavy-duty vinyl that will resist punctures or perforations. The K1 model fits one person and has a net on the deck where you can store your equipment. The inflatable I-beam floors add stability to the kayak while the overall design allows for your legs to have a lot of free space around them. It is a 2-chamber kayak that includes a repair patch, one 84-inch aluminum oar, and a manual hand pump to facilitate its use. This is a great kayak if you like paddling on your own, either at lakes or slow-moving rivers. Because it brings its own oar and hand pump, it’s also a great option for those who don’t already own them. The innovative inflatable Sevylor model presents a backpack technology that lets you carry your 10ft kayak on your back comfortably. It fits one person and includes a hand pump and a paddle. This is by far the best kayak for backpacking. The best feature of this Sevylor kayak is its “Quickpak” design, which allows it to easily turn into a backpack that will let you both save all your equipment and carry it on your back while hiking. Once put away, the kayak pack will give you enough room for food, tent, clothes, and all you might need on a short trip. Likewise, it’s as easy to set up as it is to put away, and the backpack system turns into the kayak seat. The construction is a 24-gauge PVC material that offers durability while its tarpaulin floors and polyester cover protect it from holes and other ruptures. The kayak features multiple chambers that allow you to reach back to the shore if one of them deflates, and it features the Airtight System which guarantees zero leaks. Lastly, it has both net storage areas and D-rings where you can attach and secure your gear while paddling. The Quickpak K5 is an excellent option for those who like to venture on both slow and fast currents. Although it might seem too soft for rapids, this inflatable model does actually maintain stability and balance and can be used in whitewater. This white, smooth-looking Sea Eagle kayak can hold up to 3 people and fits inside its own storage bag, foot air pump and repair kit included. It’s a high-quality inflatable kayak that offers a lot of leg room, even when packed with a lot of gear. The Sea Eagle 370 is made from a sun and saltwater-resistant hull material that makes the kayak sturdy enough to stand against extreme weather. It has 2 carry handles and a self-bailing drain valve that saves a lot of time when putting it away. The kayak features five different valves and it can be set up in less than 8 minutes, according to the manufacturer. At the bottom, you can find 2 skegs for better tracking that also contribute to its speed. The 370 comes with 2, 7’10” paddles that can be broken down into four different parts for easy storage. It also has two inflatable seats. It’s steady and one of the biggest models among similar kayaks on the market. Day trips with two people, at least. It’s a big kayak, and if only one person is paddling, it might feel wobbly. It is the ideal choice if you have a lot of equipment as well, as it has enough room for everyone and everything. This is a 10’5’’ one-person kayak by Advanced Elements that offers both technology and quality. It is an inflatable kayak that stands out for its great features and performance, allowing kayakers to enjoy their solo time in nature. The AdvancedFrame kayak is made from 3 layers of PVC tarpaulin hull material that is not only durable but also puncture-resistant, making it a long-lasting item. In addition, the kayak features aluminum rib frames on the stern and bow that allow it track better on the water. The design of this kayak presents two air chambers that provide extra safety in case one of them gets punctured, and it also has an integrated pressure relief valve in the floor. The seat is adjustable and provides a high back support, making it comfortable to paddle for long periods of time. A storage compartment and bungee deck lacing secure equipment in place while the skeg tracking fin on the bottom back enhances its tracking performance. The AdvancedFrame comes with a carrying bag and its own repair kit. This is a very stable inflatable kayak that manages to make no sound on very still waters; this feature makes it perfect for fishing! It offers a lot of space for gear on the front and the back, too. This colorful Rave inflatable kayak is a one-person 9ft item that comes folded in its own carry bag and includes a long paddle. The bright Sea Rebel is a lightweight and portable inflatable kayak that can be set up in no time. It’s equipped with a water-resistant bag and water bottle holder for when you are paddling. Moreover, it brings three bottom fins for tracking, an adjustable seat and one paddle. The deck features 4 foam-filled handles and it is constructed of a PVC tarpaulin bottom covered with heavy-duty nylon. The material on the bottom allows it to glide on soft grounds with no problem. This is a sit-on-top model where your legs rest on the top of the deck. It also brings an air pump to inflate the kayak. Relaxing at the lake or at a pond. This is not a kayak designed for white waters or rapids so it’s best to take it to a calm place where you can lay back and paddle slowly for a while. Yet another Intex model, this 10ft inflatable Explorer K2 is worth considering if you are looking for a two-person kayak that can be inexpensive and reliable at the same time. This inflatable kayak is an excellent 2-person option for those who like to paddle in couples. It includes two adjustable inflatable seats and a removable skeg that helps with its directional stability. The yellow color intends to provide safety in case of emergencies while the package includes two aluminum oars and an output air pump. The material this kayak is constructed from is a heavy-duty vinyl that resists against punctures, and the model has two separate air chambers for more effective inflation. To provide extra stability and comfort, it features an inflatable I-beam floor, and to simplify its deflation, it brings a Boston valve on each side. The Explorer K2 is wonderful for paddling with a family member or a friend. This model is specifically made for smaller bodies of water so it’s best to enjoy it at a lake or a mild river as it cannot stand fast or strong currents. This is a 12ft kayak that fits two people and lots of gear. It’s a weightless model that allows being carried in a backpack everywhere you go. This incredible lightweight inflatable kayak is made to fit two people although it can also be converted to fit just one kayaker. It comes in a dry bag backpack that allows you to put it away and transport it without a problem: portability is not an inconvenience for this Innova Sunny model. The material it is constructed from is Nitrylon, a rather new one on the inflatable kayak market but just as good, nonetheless. The interior uses Lite-Pack instead. Moreover, this model features a removable tracking fin that adjusts to the bottom back of the kayak. It’s an open kayak design, enough to be considered a canoe-style. As for the chambers, it brings three different ones that utilize military valves and twist-locks to secure them in place. Trips on flat water such as lakes and ponds. This is a perfect kayak for fishing: it has enough room for all the equipment and allows you to move around freely. Because it’s so lightweight, it’s not recommended to go to the ocean or venture in strong currents with it. The3 Sea Eagle 330 model is slightly over 11ft long and presents several high-tech features that make it stand out among similar kayaks on the market. Also, this is the best inflatable kayak for whitewater sports. This resistant inflatable kayak is constructed from an extra thick K-80 polykrylar hull material that stands strong against possible holes and punctures. It features nine-inch tubes, I-beam structure, and high-frequency fused seams that make it a sturdy item. This kayak is rated Class III White Waters, which means you can dare into faster currents and still feel safe. It comes with inflatable spray skirts, two seats, two oars, a carry bag, and a small foot pump that you can take with you wherever you go. In addition to all of this, it has a self-bailing drain valve and three different valves to inflate it. On the bottom, you can attach two skegs that will provide better tracking and higher speeds, and the bow and stern grab lines give you even more control when paddling. The kayak has three air chambers and takes less than 6 minutes to set up. The Sea Eagle 330 will do well everywhere but because it can easily stand strong currents, we suggest you take it for a ride in whitewater. Its technology and construction provide safety, stability, and speed so you can make the best out of your day on the water. This next item is the two-person version of the Intex Challenger described at the beginning of this list. It is an 11ft bright, green kayak that provides the same amount of fun and quality as it’s model sibling but this time, for two instead of one. The K2 is made of the well-known Intex rugged, Supper-Tough vinyl; this material is not only puncture-resistant but it also offers long-term durability so you can rest assured that you’ll be buying an inflatable kayak that will accompany you for years. This model comes with two, 86-inch aluminum paddles and a high-output pump that can inflate and deflate the kayak easily. Moreover, the colorful design lets it stand out on the water for safety reasons. The kayak brings a cargo net at the front, and both seats are adjustable and removable. It also brings a removable skeg that can be attached to the bottom, and grab lines on both ends of the deck. Lastly, it comes with its own repair kit. Those who like to take their time exploring calm waters such as mirror-lakes or easy rivers. A great option for fishing as it provides enough space and a gear net that let you bring along what you need to be on the water for a long time. The last inflatable kayak on our list is this 12.5ft fishing model that fits one person and has a sleek, dark-colored design. A portable and rough kayak, this Pike Angler IK will catch the attention of those who like their kayaks to be specially intended for fishing. Hence, we have rated it as the best inflatable fishing kayak. This NRS kayak features 3 air chambers and A7 pressure relief valves. The material used is a sturdy, rugged PVC that holds up to harsh weather, and it comes with a removable/adjustable single seat. At the front, it presents bungee lacing for gear and it also has 32 stainless steel D-rings. On the bottom, you can attach two removable skegs for improved tracking; it also has a stern compartment where you can save your bag. The whole kayak fits in a nylon bag with shoulder straps that you can carry when hiking. Likewise, it features a high-pressure insert on the floor thus making it flat and rigid. The model is self-bailing and includes a repair kit as well. Finally, because it’s been designed for fishing, it brings three accessory mounts for fish finders, camera booms, and rod holders. Check TrickATrout homepage for more reviews and guides. While all of the options mentioned on this list are high-quality inflatable kayaks, not all of them are perfect for everybody out there as each kayaker’s needs differ from one another and greatly depend on how they plan to use their newly acquired inflatable boat. For the solo travelers, we’ve picked the Intex Challenger K1 as it offers excellent maneuverability and is made from a durable, puncture-resistant material that is durable and long-lasting. However, the AdvancedFrame Convertible Kayak is a better choice if you like having company; this model can be transformed from a one-seat to a tandem kayak in no time. The aluminum ribs provide great tracking and it features 6 air chambers for extra safety. If you love your hikes as much as you like paddling, the Sevylor Quickpak K5 will be your best companion: with its Turn-Into-Backpack system, you won’t need much more than your inflatable kayak and savory snacks for a fun time on the water. Lastly, for those who want to be able to fish on their inflatable kayak, the NRS Pike Angler IK couldn’t be more perfect. It’s not only an incredibly rigid and stable model but its front bungee lacing, 3 attachment mounts, and 32 D-rings also provide enough room for all your fishing gear.